Labels-U-Create make bright custom communication labels using your PC and printer. Make an entire sheet or just a few at a time. Easy set-up with Microsoft Word. Ten 8 1/2" x 11" sheets per package. 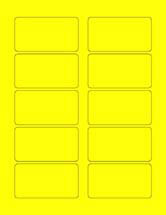 100 fluorescent yellow 3 1/4" x 1 3/4" labels.